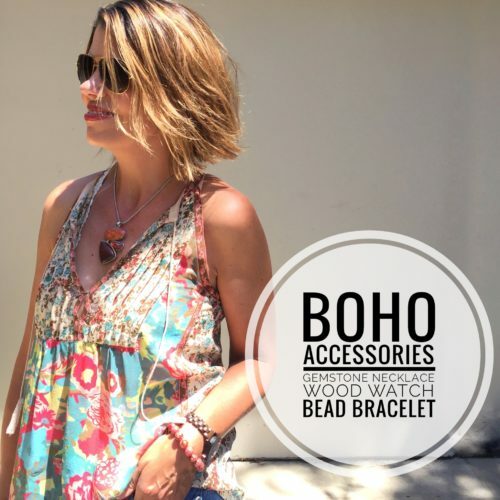 In these days of Instagram style, gorgeous style blogs, slick magazines – beautiful fashion looks are everywhere. Don’t get me wrong, I live for the inspiration, it challenges me to up my game when I’m in a rut. 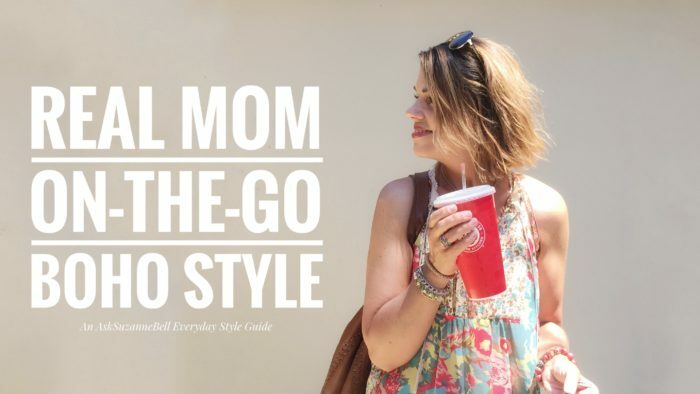 But what do real people, even us style bloggers, really wear everyday? Today’s look is 100% real and uncut. This outfit provided function and comfort, while running around doing what us moms do, all day long. My favorite look is one I can move and feel comfortable in, feel like myself, and be a little chic – all at the same time. 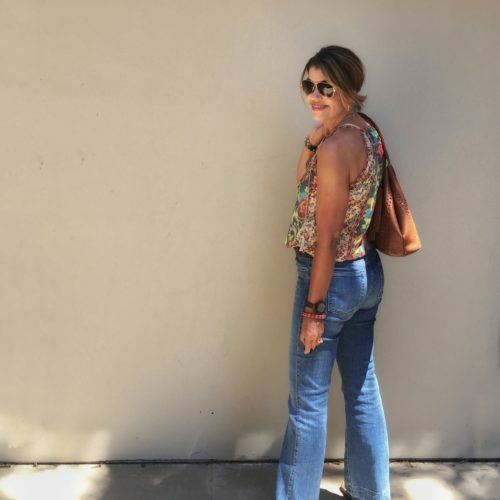 This look began with the top, a colorful sleeveless silk blouse by Joie. The top alone is a statement. 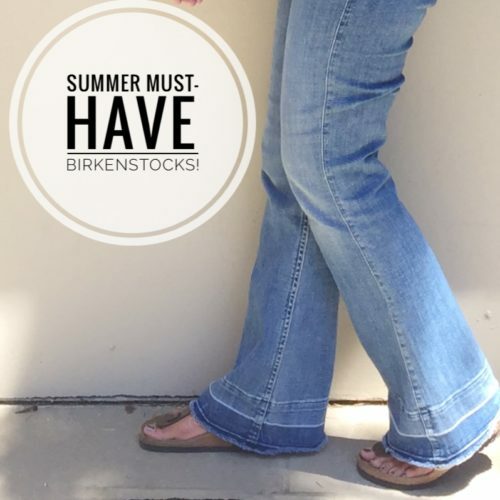 I had a lot of running around to do making flat sandals a must; Birkenstocks. 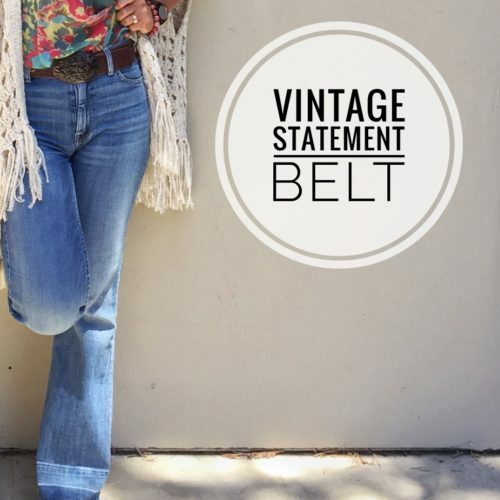 Channeling my inner Elle Macpherson, I reached for my flare jeans – the pair I had hemmed to wear with flat shoes, and big buckle belt. The bronze buckle on this vintage Oilily belt works back to my bronze Birkenstocks; the Isabella Fiore cognac bag, back to the belt. 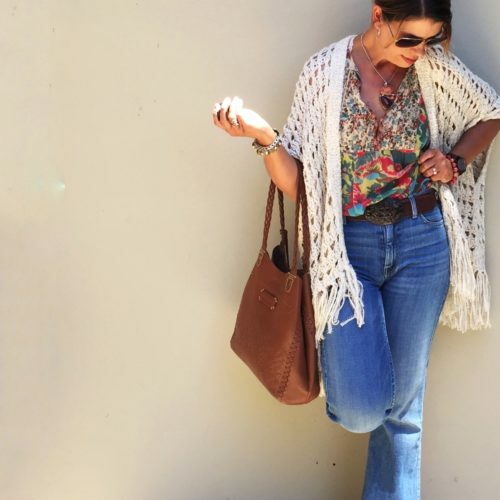 Fringe became the repeating theme; tassel on the bag, tassels on the blouse ties, raw hem jeans – my fringe poncho was a no brainer, to keep the theme going. The colors in my silver chain gemstone necklace pulled all pieces together, topped off with silver rings, bracelets, and earrings. 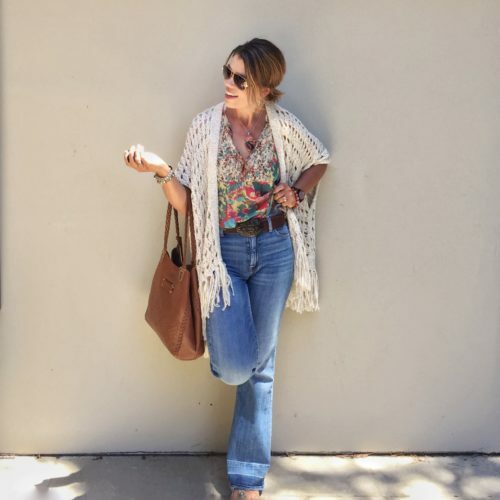 Yes, today’s outfit would elevate, if say I added some boho chic wedge sandals, a cute crop jacket, blow dried my hair, wore layers of gorgeous delicate necklaces, and carried a fancy latte instead of a super-sized diet coke. A cute Chloe bag and a designer arm stack would amp things up another level. I could have photographed a similar look for you. But then I would have had to change, and that wasn’t in the cards this week. And since we are being real, the diet coke is only 1/2 the soda, the other 1/2 being the real sugary deal. 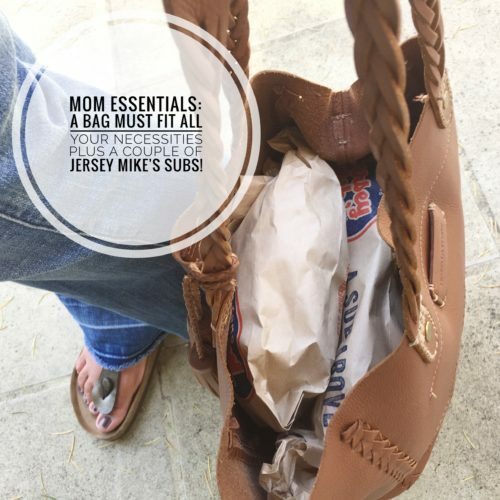 I always carry a big bag, you never know when you’ll need to tote around a few Jersey Mike’s Subs. I’ve put together a guide, to help you pull together an everyday look of your own. 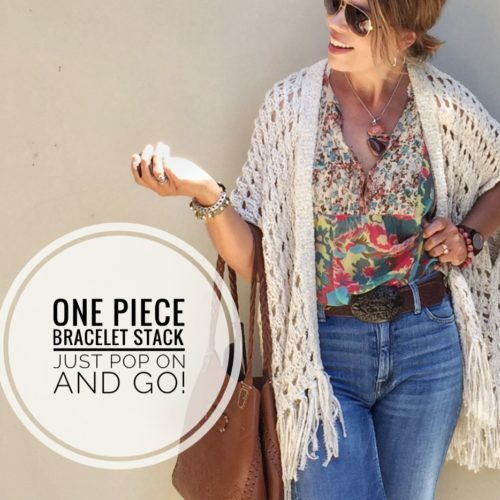 Start with one key piece – like I did with my blouse, and go from there. 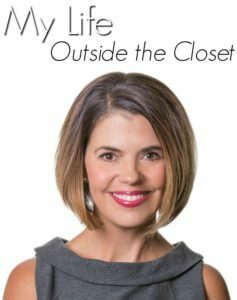 I like to work outside my closet, this helps me have clear place and come up with looks outside my usual go-to’s. 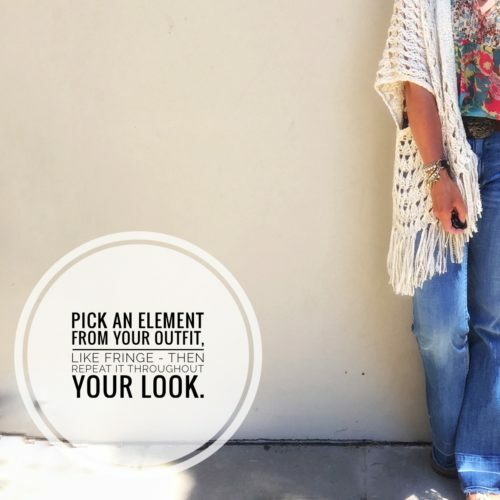 Repeat a theme, like I did with fringe and it will come together easier than you think! Most of all have fun, and don’t think about it all too much! If you like the look as is, I’ve linked similar items, available now, to check out at the bottom of this post. 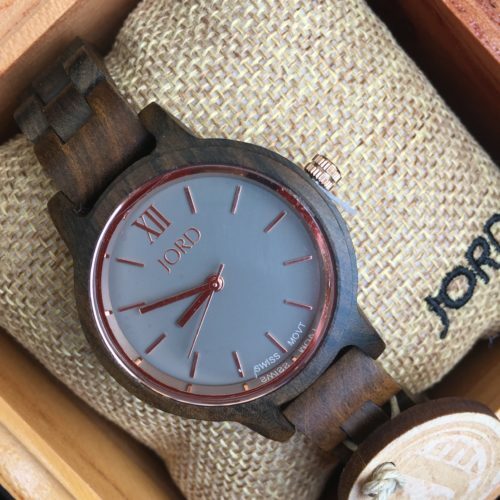 Speaking of JORD wood watches, did you get a chance to enter the JORD Giveaway? 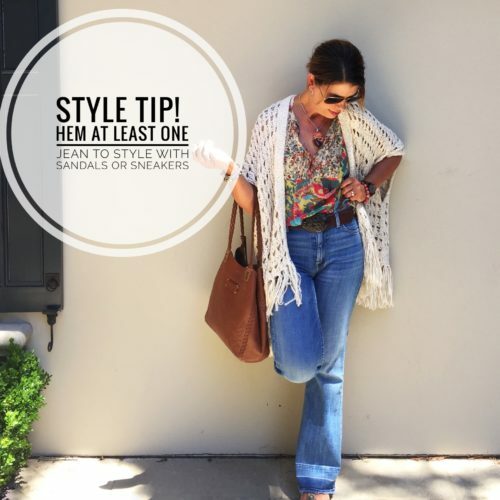 Do you find it easy or a challenge to pull of a casual everyday look? Do you have go-to pieces for everyday style? Do you go for comfort and function, or style no matter what it takes? Drop a line down below, I love to hear your feedback and questions! 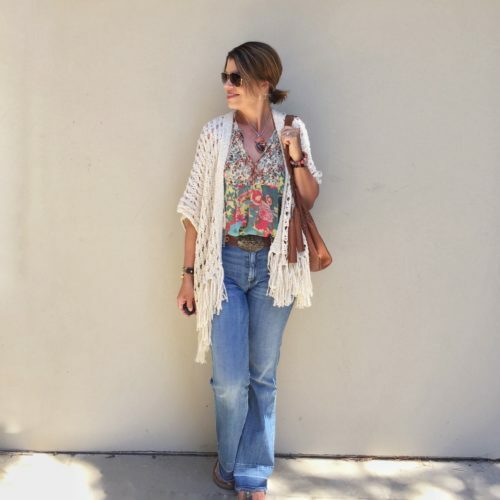 Great casual mom style! You look fabulous! Thank you Laurie! 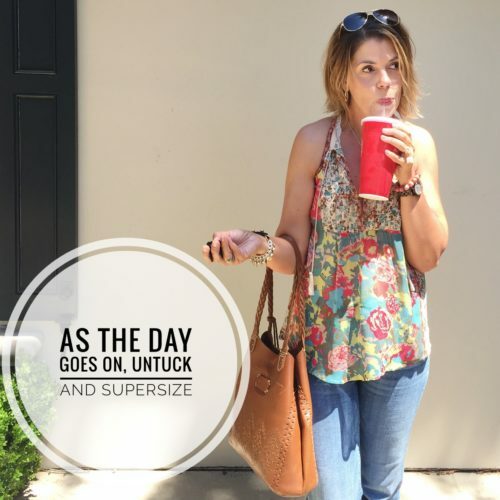 Yes, somedays require a supersize…this week has been one of those! LOL! I love that top! It’s beautiful! I have a question for you, I am quite tiny but also short waisted, everything about me is short but good of course! I love the look of jeans with belts but find when I wear this I look even shorter, hence the jean skirts I tend to wear a lot of, any tips for a shorty like me wearing jeans with belts! Love the top!! 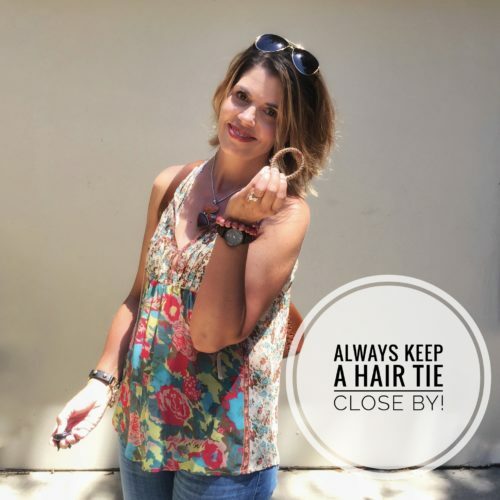 And you are so right, im never with out a hair tie! !